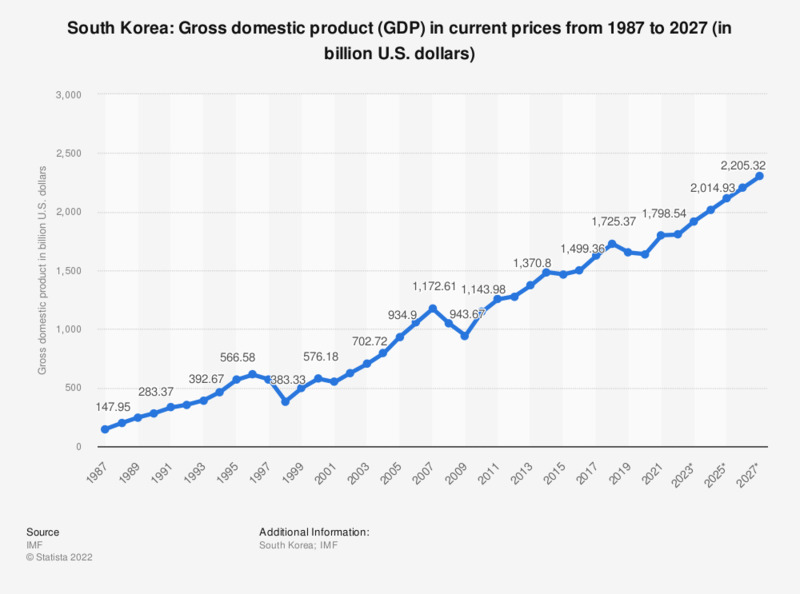 The statistic shows gross domestic product (GDP) of South Korea from 2012 to 2017, with projections up until 2022. GDP or gross domestic product is the sum of all goods and services produced in a country in a year; it is a strong indicator of economic strength. In 2017, South Korea's GDP was around 1.54 trillion U.S. dollars. See global GDP for a global comparison. South Korea is doing quite well economically. It is among the leading export countries worldwide, it mainly exports electronics, automobiles and machinery. South Korea is also one of the leading import countries worldwide. Additionally, it is one of the leading countries with the largest proportion of global domestic product / GDP based on Purchasing Power Parity (PPP). Its GDP has been increasing for the last few years, while the gross domestic product / GDP growth in South Korea has not been steady but increasing since 2009. South Korea is an OECD member and a member of the G20 states. Among the latter, its GDP growth was higher than that of the United States or the European Union in 2013. South Korea is one of the fastest-growing economies worldwide. Its standard of living is also considered to be quite high, the unemployment rate, which is one key factor, has been at around 3 percent, give or take a few percentage points, for the past decade. As a comparison, the United States’ unemployment rate was almost twice, sometimes three times as high as in South Korea during the same period. As for employment, South Korea’s rate is almost the same as that of the United States or France, with more than 60 percent of employed persons in the population.